The Volkswagen stock price popped 2.57% to $27.55 this morning (Tuesday) after the company announced it has agreed to pay up to $14.7 billion to settle claims that it intentionally misled regulators. Regulators have called the settlement a "significant environmental and consumer relief." But the settlement news and today's Volkswagen stock price rally are not reasons to buy Volkswagen AG (OTCMKTS ADR: VLKAY) stock. You see, the company's problems are far from over. But before we get into the Volkswagen stock outlook, here's everything you need to know about today's massive settlement. The national settlement announcement came at 9:30 a.m. Tuesday from the Department of Justice, the Environmental Protection Agency, and the Federal Trade Commission. After admitting in 2015 to installing "defeat devices" in 475,000 of its diesel cars, Volkswagen agreed to pay $14.7 billion. Owners have the option of having Volkswagen repair or buy back the polluting vehicle. Owners of the affected vehicles can expect to receive $5,100 to $10,000 in cash compensation. The fixes offered to Volkswagen owners are designed to lower emissions. But they are also expected to compromise the car's performance. The company will begin buying back the vehicles as early as this fall. The German automaker will also put $2.7 billion into a trust to fund environmental remediation and commit another $2 billion to promote zero emissions vehicle technology. The news was welcomed by investors as the Volkswagen stock price traded up roughly 2% all morning. It's a bright spot in an otherwise dismal year. Even including today's gains, the Volkswagen stock price in 2016 is still down almost 12%. "This historic agreement holds Volkswagen accountable for its betrayal of consumer trust, and requires Volkswagen to repair the environmental damage it caused," said lead counsel Elizabeth Cabraser, chair of the 21-member Plaintiffs' Steering Committee. The Volkswagen settlement is the largest consumer auto industry class action settlement in U.S. history. It was made public last September when Volkswagen admitted that some of its diesel vehicles used illegal "defeat device" software. Volkswagen equipped certain 2.0-liter vehicles with software that detected when the car was being tested for EPA compliance and produced emissions that were different from actual on-the-road emissions. Regulators said Volkswagen's diesel cars emitted nitrogen oxides at 10 to 40 times the federal limit. The DOJ also said Volkswagen violated EPA regulations by applying for certification with certain vehicle designs but then importing vehicles with different designs. Additional investigations and suits are pending that could drive Volkswagen's costs even higher. The company still needs to resolve issues with its vehicles with 3.0-liter diesel engines. Those have been cited by the EPA as being in violation of pollution limits. And there's also what happens to European customers. Volkswagen maintains it sees no reason to compensate European customers because of differences in U.S. and European law and environmental standards. 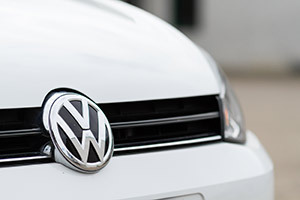 Under EU rules, Volkswagen's diesel vehicles don't violate emissions standards. The automaker also said that vehicles containing the illegal software can be more easily repaired in Europe. Volkswagen is recalling nearly 3 million vehicles in Europe to remove the defeat devices and make the cars compliant with the law. However, European officials, consumer groups, and plaintiffs' attorneys say Volkswagen should compensate European victims to regain customers' trust. The European Consumer Organization said Volkswagen should compensate car buyers who have been "massively misled." The Brussels-based lobby group added that European car owners shouldn't be treated differently than U.S. customers. So you see, the actual cost of "dieselgate" is still unknown. And the biggest headwind for the Volkswagen stock price will be the loss of its once-esteemed reputation. "The reputational damage to the VW brand may represent an extinction-level event," Money Morning Chief Investment Strategist Keith Fitz-Gerald said when the scandal was emerging. "In the words of branding expert Jim Prior of Lambie-Nairn in London, VW will 'have to live with the legacy of being a brand that cheated,'" Fitz-Gerald said. That will impact earnings in years to come, Fitz-Gerald continued. Even with today's jump, the Volkswagen stock price is down 11.6% year to date and 43.8% over the last year. We still recommend avoiding Volkswagen stock in 2016. The New York Times: Volkswagen to Pay $14.7 Billion to Settle Diesel Claims in the U.S.